Microservices architectures speed up innovation in government. Instead of spending months or years building monolithic applications, developers quickly build a suite of small services, each running as an independent process in its own logical machine or Linux® container. As government needs change, developers replace, upgrade, scale, and deploy individual microservices—in far less time than they would need to change the entire application. But who owns the data in a microservices architecture—the database team or the application team? The answer determines how much agility you will gain from microservices. In most government organizations, application teams submit schema change requests to the database team. Then they wait while the database team evaluates the request to be sure it will not interfere with performance, security, or resilience. Conflicting priorities create tension: Application teams prize speed while database teams value caution. The Red Hat® solution meets both teams’ goals. With Red Hat Data Virtualization, the database team creates reusable virtual databases for each application team. Application teams more quickly introduce new features because they can freely edit the schemas in the virtual database and include them in the continuous integration/continuous delivery (CI/CD) pipeline. Database teams retain complete control over physical datastores. With Red Hat Data Grid, resilience improves because microservices can continue writing and reading to in-memory data grids even if the central datastore goes down. Government developer teams want control over their application’s data schema and role-based access control (RBAC). But replicating data into dozens or hundreds of databases—one for each application—is not practical. Problems include security risks, high management overhead, and loss of data integrity. Replication erodes the single source of truth. Define database schemas without having to own or maintain a physical database. Provide role-based access to data. Include schemas and changes as part of the CI/CD pipeline. Define transactional boundaries, such as percolating application requests across several microservices. Government IT teams can safely give data ownership to application teams by using Red Hat Middleware to create virtual databases and data grids. Table 1 summarizes how this architecture compares to existing government architectures. Virtual databases neatly solve the data ownership problem by giving application owners ownership of their data views and access control. But there is one problem: If the underlying database goes down, so do all of the virtual databases. Red Hat Data Grid makes virtual databases resilient. An in-memory, distributed, NoSQL datastore solution, Red Data Grid synchronizes copies of data across multiple servers (Figure 1). Virtual databases connect in real-time—not to the physical database, but to the distributed data grid. The data grid becomes the source of truth for applications built from microservices. Containerized applications write to the virtual database. The virtual database writes to the data grid, synchronously. The data grid writes to the underlying datastore, asynchronously. To upgrade or migrate the database, the database team simply stops taking asynchronous writes. The traditional concern about in-memory activities is resiliency. What happens if a data grid instance goes down? Red Hat Middleware overcomes this objection by treating the physical datastore as the archive. It is the equivalent of tape in legacy architectures. A data grid node that fails is automatically restored from the central datastore. There is no data loss, no loss of service, and no need to reload or resync the data. Innovate faster. No more waiting for the database team to make schema changes. 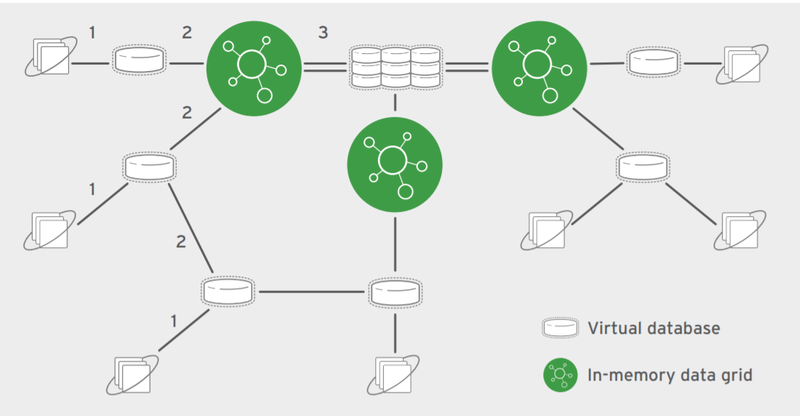 Simplify deployment. Developers onboard the database schema to the CI/CD pipeline. They deploy the virtual database right alongside microservices. Reuse data views for new microservices. Developers can reuse and combine existing data views for new microservices. Reclaim time. No need to evaluate and fulfill requests for schema changes. Increase resiliency. A data grid node that goes down is automatically restored from the central datastore. Improve control over data security. The database team centrally controls access to underlying data sources by user or role. No need to individually configure each data source for access by dozens of microservices. Connect. The virtual database establishes real-time connections to any data source. Teeid, a Red Hat project, distributes application queries across all underlying sources. Compose. Teams compose virtual tables to create the ideal application view. Consume. 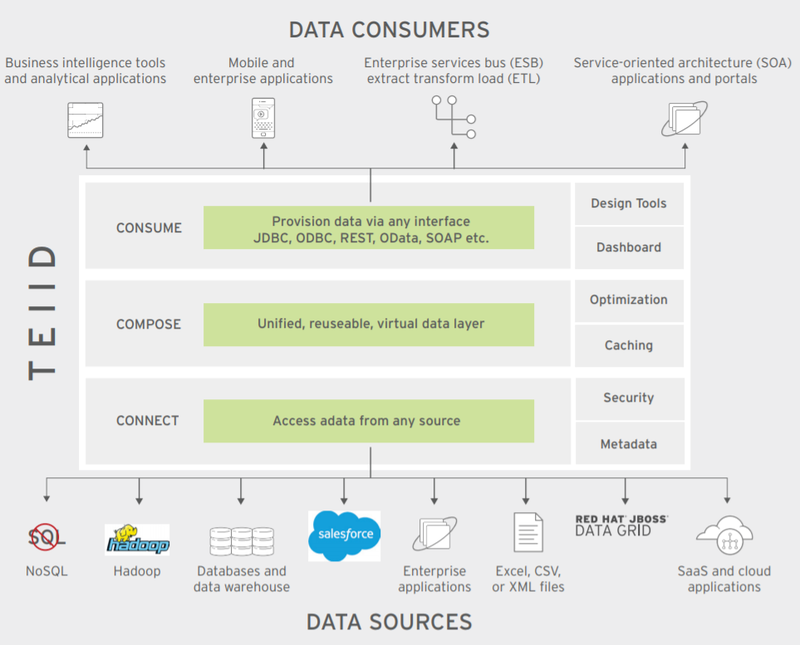 Microservices provision data via any interface, including JDBC, open database connectivity (ODBC), REST, open data protocol (OData), simple object access protocol (SOAP), and others. The agility you gain from microservices architectures depends in large part on who owns the data. Many more entities access the datastore, so expecting the database team to quickly fulfill requests for schema changes is unrealistic. Red Hat JBoss Middleware relieves the database team by creating a virtual data layer owned by application teams. Developers can create the ideal data view for their microservices and include the view in the CI/CD pipeline. Freed from making schema changes, database teams reclaim time to focus on security, performance, and data integrity. Simpler operations—the result of completely decoupling the application development and database life cycles. Avoidance of data replication—strengthening data integrity and security while reducing management overhead. Learn more about Red Hat Data Virtualization at redhat.com/en/technologies/ jboss-middleware/data-virtualization. Learn more about Red Hat Data Grid at redhat.com/en/technologies/jboss-middleware/ data-grid.